I’m back with the next part of my DIY mirror project – how I turned my cheap, black square mirrors instead something way more fab! 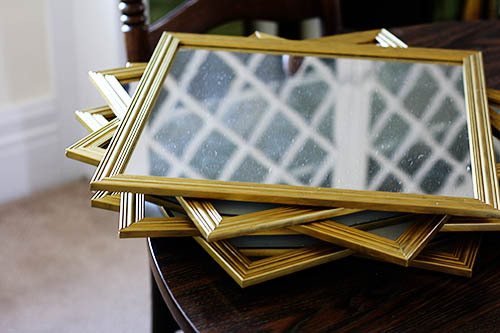 Yesterday I told you how I glammed up the frames by hand-painting them gold. That project took twenty-four coats and also I am a little nuts sometimes. Cleaning the mirror part was, uh, obviously still to come. 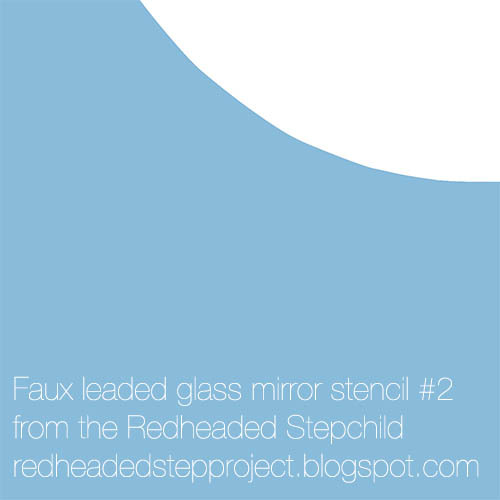 Today I’ll tell you about the part that seemed simple: designing the shapes I would draw on the mirrors to recreate the leaded-glass look. 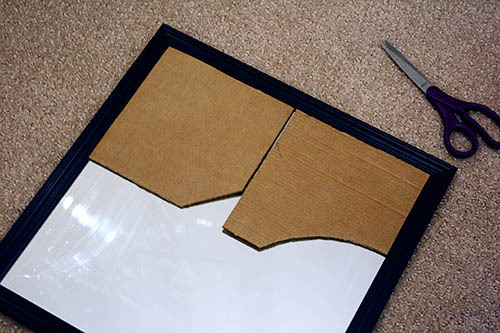 I decided that, because I was dealing with square mirrors instead of long rectangles, I’d just divide Ballard’s garden mirror design in half. To get a feel for whether I liked it, I just sketched it right on the mirror with dry erase marker. Square diamond and half a marquis shape, dat’s it. I played around with the size of each, just wiping off the dry erase marker and re-sketching, until I felt I had the proportions I liked. 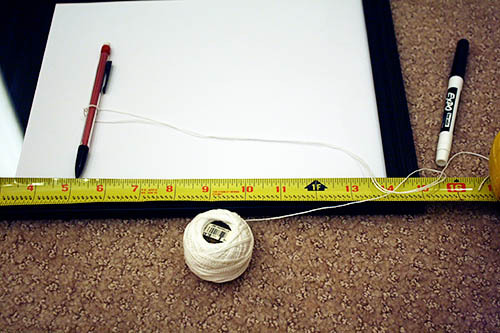 “Doing it up right” involved scrap paper, a tape measure, an L-square, and a makeshift compass created from a pencil and a length of string still attached to the spool. WHY do I make everything so HARD. The square-diamond in the middle was easy enough. 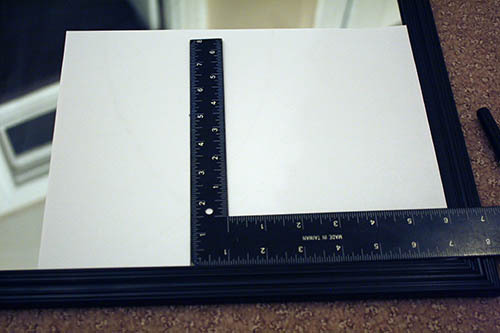 I knew how big I wanted it, and centering it was as easy as making sure the distance from the side of the frame to a corner of the square was the same. But the half-marquis... ugh. It took more than a few tries. See, I knew how tall I wanted it, and I knew how wide I wanted the base. But I couldn’t figure out how to make it curve the way I wanted. 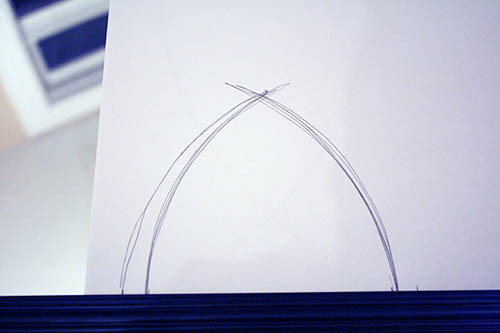 Mr. P gets credit for suggesting the string-compass idea to me when I asked him how I could make a “curvy bulgy triangle”. Figuring out how to set up the makeshift compass so that it worked for me was another story entirely. 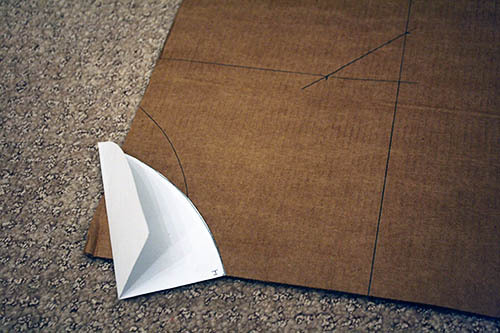 I’d get the right width for the base, but the shape would be too tall. Or the height would be correct, the base was too wide and squatty. More than once I wandered into the living room and pleaded with Mr. P to help me with my string compass and bulgy triangle. His suggestions of “Use a different part of the circle” could really, really only be helpful to another math teacher because that means nothing to me, math genius. Look hard in that photo above, and you can see my many other attempts on the other side of that piece of paper. Say, what was that about your AP test score? Even now I can’t tell you how I eventually made it work to create the shape I wanted. With enough trial and error, though, I was able to get the curve just right, cut it out of the paper, and trace it onto cardboard. 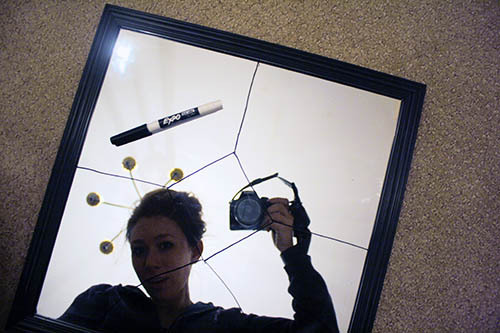 And with the cardboard, I made the real stencils that I’d use to trace the design onto all six mirrors. The stencil with the notched corner is to create the square diamond in the center, plus the lines connecting to it. The curved stencil is just for tracing the half-marquis shape, but the size of the stencil means it fits right up in the corner, so the half-marquis is in the perfect spot. To make sure they would work, I went back to my dry erase marker. Sure enough, the stencils worked just as I’d hoped! 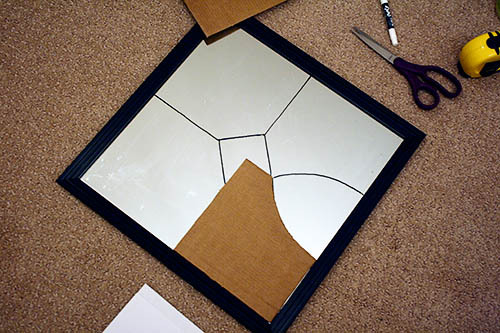 Now I could be confident that I could stencil the pattern onto all six mirrors and see them line up, with straight lines and symmetrical patterns. If you can’t notice a difference of 1/16” or lines that aren’t perfectly parallel, well, you probably don’t understand why I spent so much time on this. But I can notice those little inconsistencies, and they drive me crazy. Rather to be crazy for a few hours one night than for years to come... yes? All you have to do is scale the image – just adjust the width/height to half the width/height of the square you are stenciling. 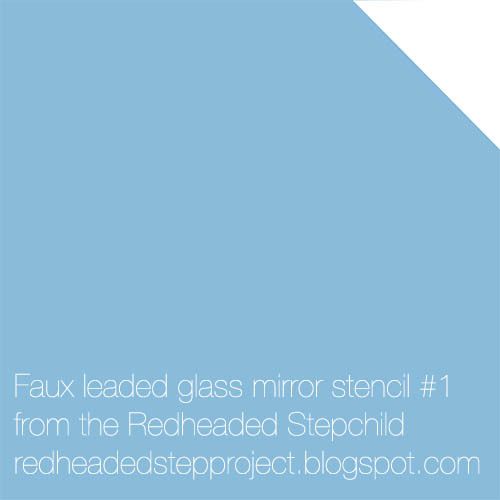 My mirror was fourteen inches across, so my stencils were seven inches square. Easy-peasy. Boom, I just saved you like two hours and a lot of swearing at a makeshift string-compass. So there you have it! Less a how-to and more a here’s-how-I’m-crazy,-now-have-some-stencils. Tomorrow I’ll show you how I used these stencils with the newly painted frames and finished this pretty project up!